Japan is now the fourth most visited country in the world, falling behind Spain, the United States, and France (The Travel & Tourism Competitiveness Report 2017, The World Economic Forum). It’s tourism industry is growing rapidly, and at a much faster pace than expected. With international visitors amounting to 24 million in 2016, the new target from the government is set for 40 million by 2020. While Japan overflows with ways to keep tourists entertained during the day, in comparison to cities in the US and Europe, its night life falls short. As inbound tourism increases, the demand for night entertainment, which includes- musicals, live music, dance, club culture, and so forth is growingly evident. 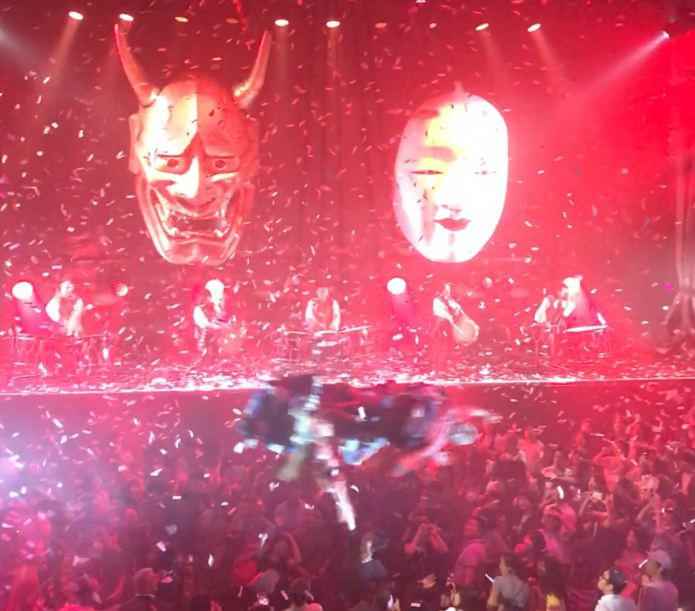 According to Nikkei News, in an effort to promote Japanese nightlife, “WA!” a 70 minute show by the Argentinian performance group Fuerza Bruta collaborated with Panasonic and held its world premiere in Shinagawa Stellar Ball. The show incorporated Japanese cultural elements- such as traditional drums, music, costumes, images, and dance style. The latest performance was from 20:00, providing tourists with an after dinner activity. As tourists are busy sightseeing during the day, they are free to go to events after dinner. The main target for night economy is to provide further entertainment options from 20:00 ~ 3:00 AM. At this time, food/ drinks, clubs, and karaoke are the main sources of entertainment. Golden gai, a street with small bars in Shinjuku is a popular night activity for tourists visiting Japan. Roppongi is also a popular option as it has a variety of bars that cater to English speakers at night. With that said, the percent of contributions made to the economy by tourists at this time frame is small. During this time frame, tourists tend to gravitate to the frequently promoted night options which at this point in time include Shinjuku’s “Robot Restaurant” and Harajuku’s “Kawaii Monster Cafe”. There is an effort to provide further show options from a later time frame. MANGEKYO, produced by JTB is a Japanese modern drum show that started mid September. This performance starts from 20:30 to accommodate foreign tourists that want to sitesee during the day. Due to its high rating, JTB is making efforts to make this become a permanent show. Shochiku, a large Kabuki company is also warming up to the idea of late night performances. The government is actively promoting the night economy movement in efforts to revitalize the economy. In 2011, 1.2% of Japan’s GDP came from Cultural Resources. Japan would like to increase this figure to 3%, which would be comparable to France and Canada’s figures. Tsukasa Akimoto, Deputy Minister of the Ministry of Land, Infrastructure, Transport and Tourism (MLIT) told Nikkei News that “It has long been said that Japan has a shortage of facilities for nightlife events, but it’s now possible to create a healthy market for them.” The government has set up a study group to raise the nightlife economy, as well as resolve problems including traffic, infrastructure, overtime restrictions, and the safety of young persons. On July 20th, Tsukasa Akimoto had a keynote speech at Asterisk’s seminar on luxury hotel developments and integrated resorts, touching on what these kinds of developments can bring to Japanese economies, and the necessary steps Japan needs to take to allow for such developments to succeed. The movement to focus on nightlife economy is increasingly becoming a worldwide trend as it can spark new markets without major investments. An example of how European and American cities have done this is by having their subway systems run 24 hours. In New York, broadway shows can stay open till around 23:00. By having a 24 hour subway system, tourists from all around New York can come and enjoy the show without worrying about how to get home. Broadway shows alone have an economic effect of over JPY 1 Trillion a year in New York. In September, the UK also started 24 hour subway system, as Nikkei News reported. Considering Japan already has services, resources, and industries dedicated to nightlife, with proper support and reform from government as well as marketing to overseas tourists, we feel Japan can have greater potential than other cities. With this effort to further promote inbound tourism, new opportunities for real estate developments and Integrated Resorts also increases. With more opportunities in Odaiba, Roppongi, and other entertainment focused cities, we can predict further developments to keep tourists entertained in the evening. There will be more opportunities for assets with entertainment functions, and assets that can support entertainment related tenants. Existing assets will also be revalued if subway transportation is increased to 24 hours. Based on our discussions with policy makers, night time economy will be centered around cities that host the upcoming integrated resorts, and as such the method to invest can be tailored accordingly. For institutional investors, it might be interesting to create a special strategy in the upcoming IR & Nightlife Economy sector. Asterisk has been strongly committed to this new field, and creating investment opportunities, especially in luxury hospitality by bridging international hospitality operators, IR operators and investors with Japan’s emerging industries.